One night in the late 1940s, Abraham Nemeth was helping some World War II vets with their calculus studies when he went up to the blackboard to work out a problem. Now this may not seem remarkable, but Nemeth was blind, and a blackboard is, well, flat. Notwithstanding, Nemeth later recalled that he didn't find writing on the blackboard difficult. Little did he know the chairman of the math department was watching carefully, and was impressed with Nemeth's math skills. Soon thereafter, Nemeth says, "I received a telegram from him asking if I could replace a member of the math faculty who was ill. The telegram asked if I could start next Monday. I said yes." 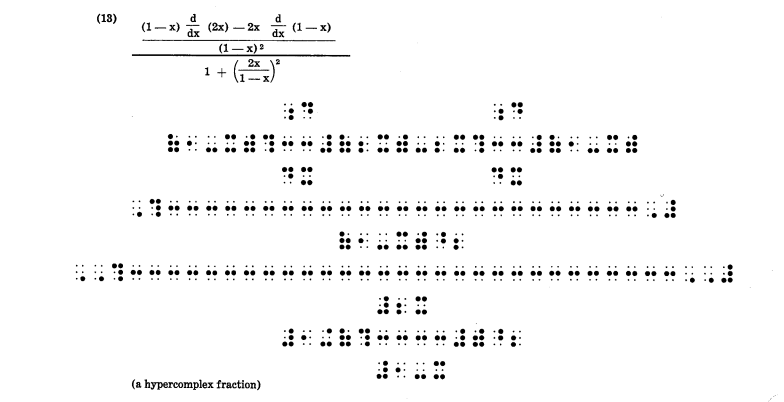 For example, when you say “x to the n power,” the phrase “to the” means “begin a superscript,” and the word “power” means “return to the baseline.” So in my Braille code I created symbols that mean “begin superscript” and “return to the baseline.” My personal code for Braille mathematics began to evolve. I used it for my work in calculus and statistics. That code, today known as the Nemeth Code, has been instrumental in opening up careers in science and math to people who are blind or have other visual impairments. According to the National Federation of the Blind, the man who gave the world this code has now passed away, two weeks short of his 95th birthday. Nemeth said that, while he had liked math from an early age, counselors discouraged him from pursuing a career in it because of his blindness. "I heard this from so many counselors that I believed it," he told interviewer Caryn Navy. "After all, there’s a saying, 'If three people tell you that you’re drunk, you’d better lay down.' " He decided to major in psychology instead, and he eventually got a Master's from Columbia University. As it turned out, "it wasn’t so easy to get a job as a psychologist either." His wife said to him, “Wouldn’t you rather be an unemployed mathematician than an unemployed psychologist?” and he was convinced. Since its inception, the Nemeth Code has been periodically updated. Navy asked him when it would be finished, and he replied, "When will mathematical notation be finished? The purpose of changes is improvement, not changes." He continued, "Mathematicians are intrinsically lazy creatures," adding, "They spend years trying to find an easier way to do things."